Kornerupine was discovered in 1884 in Fishernaes, Greenland by Danish gemologist and explorer Anreas Nikolaus Kornerup (1857-1883)and named Kornerupine in his honor. It was not until 1912 that gem quality material was found. Even now it is uncommon and rare mainly cut for collectors. The transparent gems are strongly pleochroic, it appears green or reddish brown when viewed from different directions. To show the best color it is cut with the table facet parallel to the length of the crystal. Localities include Madagascar, Sri Lanka, and East Africa. East Africa produces an Emerald green colored variety. 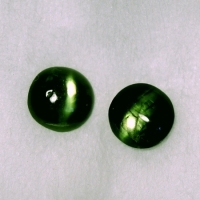 Cat's eye gems are cut from Sri Lankan and East African stones. Kornerupine has a hardness of 5.5 to 7 on the hardness scale and is highly prized by collectors and for use in jewelry. Fine grade natural gemstones from East Africa.